Housed in a conservation shophouse along Purvis Street, First Thai is located close to Beach Road. A no-frills diner, First Thai has been around for the longest time. I used to go there for rustic Thai dishes such as crispy omelettes - a pleasant change from the refined palatial cuisine served in Yhingthai Palace. I stopped going to First Thai in the last five years of so because of the gruff service. The area is undergoing gentrification so I was pleasantly surprised to find First Thai in the same spot and looking exactly as I remembered: an old school corner coffee shop without air-conditioning, furnished simply with functional tables and chairs and pretty garish tiles. Now that my office is close by, I've been having lunch at First Thai fairly often as they serve a delicious lunch special: Duck Noodle Soup. 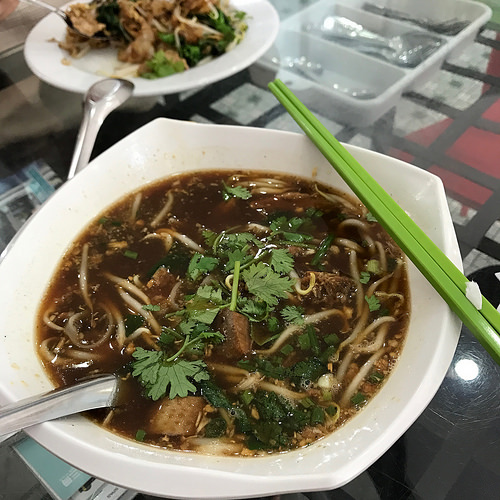 The Duck Noodle Soup is available in both spicy and non-spicy versions. I thought the tart flavour of the vinegary chili sauce overwhelmed the flavour of the spices in the aromatic broth. I prefer the regular broth with cut birds eye chili in fish sauce on the side for heat. The robust broth was enhanced by the nutty flavours of the browned garlic. The silky strands of rice noodles, crunchy bean sprouts and succulent chunks of braised duck made this a very comforting meal, especially on a rainy day. The Duck Noodle Soup here is a Must-Try! First Thai's Phad See-Eu (fried rice noodles with soy sauce) is a tasty alternative if you're not a fan of duck or keen on perspiring over a bowl of hot soup on a warm afternoon. Diners are offered an option of pork or seafood and regular or large portions ($8 & $12 respectively). 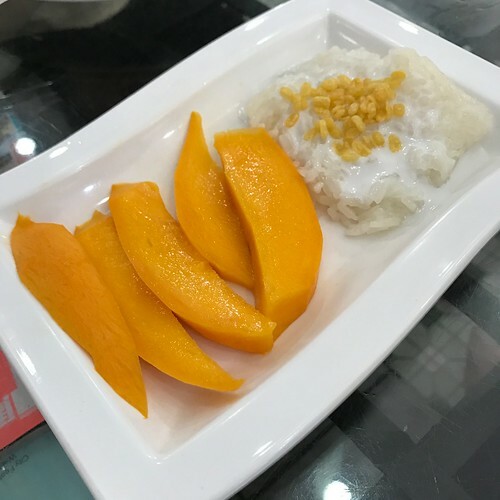 First Thai serves Mango Sticky Rice and Sticky Rice with Durian for dessert during lunch. Priced at S$5 for a fairly small plate, we thought the steamed glutinous rice grains were just a tad too hard and not fluffy enough. Since our last Mango Sticky Rice experience was rather underwhelming, we've been skipping dessert since. PS: First Thai doesn't charge Service Charge (10%) or GST (7%) at the time of publication ie. 23 Feb 2017.